We will never send you spam or share your details with anyone else. Q. What made you choose to offer Grassington House as a wedding venue? John and I fell in love with Grassington House eight years ago. We came to the area, saw the opportunity to take over the house and have lovingly renovated and restored it since then. We find it such a warm, relaxing and intimate house, that we were sure other people would want to have the opportunity to make it their own too. So we licensed it as a venue and couples can take over the house in its entirety. People tell us that it’s pretty special. Q. What special touches can you offer to a bride and groom? Grassington House becomes the bridal couple’s home for the duration of their wedding. It’s a takeover of the house to make it their very own, with a high quality service that meets their expectations and beyond. We work with the couple to design the menus, organise a tasting and then plan the event. We either take a lead, making suggestions for the food, flowers and entertainment, or our extensive experience in event management means that we can tailor the event to the couple’s wishes. Q. John is an excellent chef, whose passion is for locally sourced and seasonally inspired dishes…traditional, but with an eclectic Grassington House twist. There are so many different things we can do here, from heaters on the front patio, with blankets for guests to keep warm on cooler nights, to small bands in the bar for post-dinner entertainment. Couples can even design their own cocktail. Q. What’s the bridal journey at Grassington House? We suggest the bride and her party take their room the night before, so that they can start the journey as early as possible, a glass of champagne can help any pre-wedding nerves. Then the bride can enjoy her breakfast in her room and get ready at her leisure, knowing she only has a short journey downstairs to the next chapter in her life. A three-course seated dinner can be served to 46 guests, whilst a buffet is suitable for up to 60 and we work closely with florists and photographers should any contacts be needed. 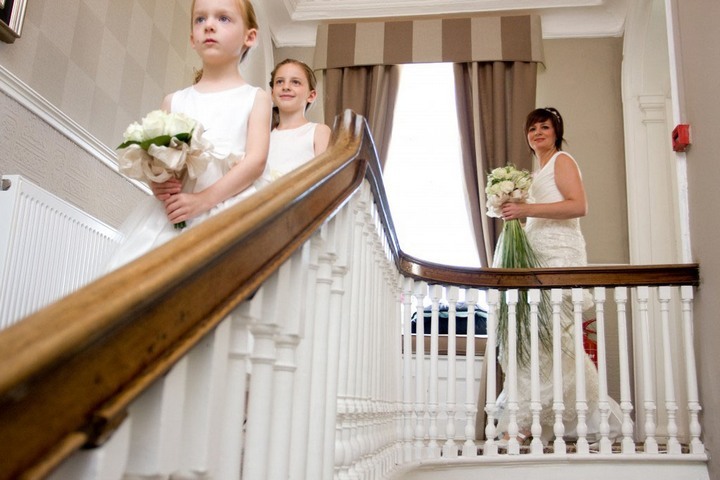 Drinks or dancing in the bar and the main bridal party are just a staircase away from one of our nine rooms, with other local accommodation a short distance away. Q. How do you personally feel about weddings? What do you like about weddings? I am a romantic and John has a big heart. But what gets us most inspired is that we have the ability and experience to really make someone’s event come to life, and that feels like a gift. John’s exceptional skills in the kitchen and his passion for food, whilst being innovative about what will really excite people. The team’s dedication to delivering a superb event, means that we’re proud of what we do and we do it well.